Your home away from home, MASO DI VILLA has been created in accordance with typical, local traditions, in a familiar environment to completely satisfy all the requirements for a comfortable and relaxing break. Two Superior double-rooms and four Classic double-rooms, all very individually appointed with fine country antiques and each more delightful than the other, are divided among the top floors; all are decorated with care and attention to detail, and have ensuite bathrooms and gorgeous hillside views. Sympathetic, harmonising colours (orange, yellow, blue, lilac, green, rose) give a different feel from room to room, and harmonize perfectly with original wood-beamed mansard ceilings and wooden flooring, custom-made wrought iron beds or a wooden floral motif headboards, beautiful fabrics and paintings, embroidered linen sheets, and blend with the overall refined, intimate and welcoming ambiance, to provide a warm, homely feeling throughout your stay. If they feel like you, we’d love you to book your stay now. All room prices include our wonderful home made breakfasts. The living room is painted in a glowing shade of yellow, and is a lovely place to take afternoon tea or to enjoy a relaxing cup of morning coffee; here are grouped comfortable sofas covered in myriad textiles, from tapestry cushions to colourful patterns, that give visitors the feeling of being at the home of friends. Outside, the surrounding vineyards, cypress trees and extensive vegetable garden give our guests the authentic feel of country living; ideal setting for an unforgettable holiday. We guarantee that booking directly with ourselves you will get the best price! Click here for details. We check our rates daily and are confident you will not find a better rate anywhere else on the internet. We have one of the most secure systems on the market today. Imagine waking up to the smell of wisteria and roses coming in through the open window. If you like the sound of this then perhaps our Orange room could be the one for you. Large room on the first floor, with garden view. The deep orange colour of the walls give this room a warm feel. A cosy, bright and comfortable room on the first floor, with a garden view. Big windows, custom-made wrought iron bed, small antique wardrobe. Its yellow colour gives the room a fresh feel. Comfortable, bright room, on the first floor, with windows on two sides. 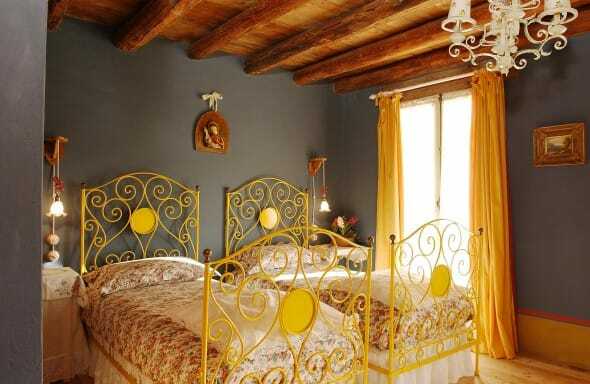 Big windows, custom-made wrought iron bed painted in yellow. Beautiful view, overlooking the courtyard and onto the garden and the vineyard. A large, comfortable double room on the second floor, with lilac walls and floral prints that gives this room a fresh, breezy feel. This feeling is boosted by the lovely outlook of the garden and onto the hills from the windows on two sides. 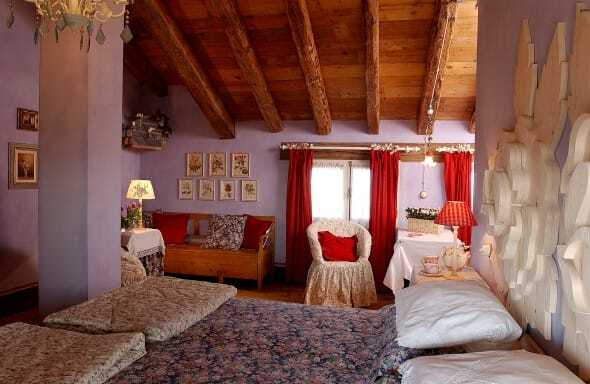 It is a charming and romantic room with floral details. It is on the second floor, which means that its views over the garden, the vineyards and the whole countryside are even better than the rooms below it. The room has a king-size bed but can be made up as a twin room if guests require. 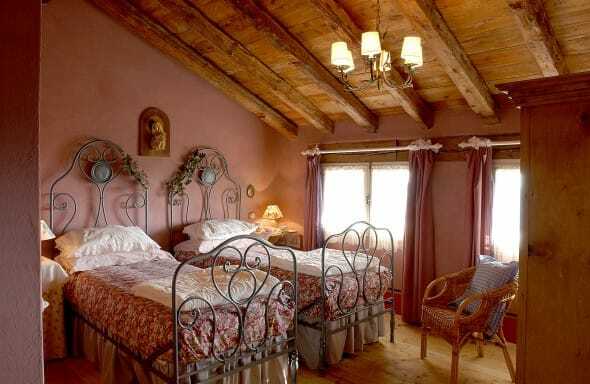 Charming and romantic Classic double room, on the second floor, with windows on two sides. Floral details, beautiful paintings, custom-made wrought iron bed. 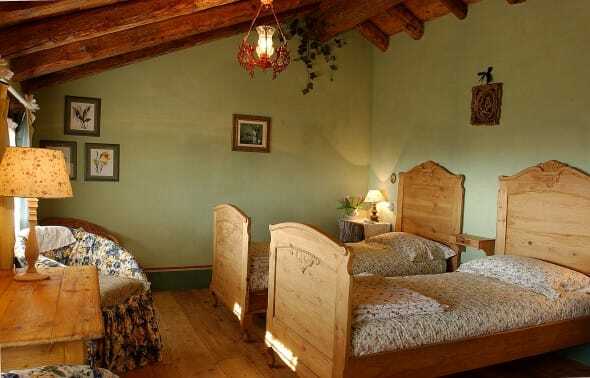 The room has a king-size bed but can be made up as a twin room if guests require.